Television viewers in Australia were in a privileged position for the Apollo 11 Moonwalk. Before the mission, plans were made for the Australian television networks to use the TV from Sydney Video  where the best picture from either Honeysuckle or Parkes was selected for transmission to Houston. When the broadcast began, problems with the scan converter settings at Goldstone meant that viewers of the international TV broadcast (i.e. the official broadcast via Houston) had trouble making out what was happening. 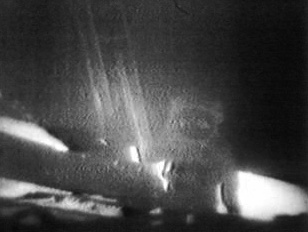 The picture was dark and Armstrongs legs and boots were only visible as a silhouette against the bright lunar surface. This changed when Houston selected Honeysuckles picture (coming from Sydney Video) as Armstrong stood on the footpad and not long before the first step. In Australia, viewers initially saw the dark picture from Goldstone. However, as Armstrong reached the bottom of the ladder, and jumped up again to check his step, the Australian Broadcasting Commission  which was relaying to the other Australian networks  switched to Honeysuckles picture, coming via Sydney Video. Until recently, it seemed that all recordings of the Australian broadcast had been lost. While researching Apollo 11 TV, John Sarkissian, from the Parkes Radio Observatory, contacted the Australian Broadcasting Corporation (formerly the Australian Broadcasting Commission). It includes the ABCs switch away from the international broadcast coming from Houston (showing Goldstone TV) to the Honeysuckle Creek feed via the Sydney Video switching centre. As the Australian TV footage begins, notice a flaring in the picture as Ed attempts to brighten the scene. Because Australian radio and TV used the audio from Goldstone via Houston (Net 1), trans-Pacific propagation delays meant that in Australia the TV pictures were almost exactly 1 second ahead of the audio from the Moon. It is unlikely that this Australian version of the ladder sequence had been seen outside Australia until recently. Click the image to open the 13MB MPEG4 video file in a new window. Or click here for a 24MB 640x480 version. More of this footage is available on the DVD. This was the only known recording of this sequence recorded in Australia, using the video from Honeysuckle (and audio from Goldstone), until November 2006 when the author identified a recording made at Sydney Video. One other Australian commercial TV kinnie recording was found in 2008. Thanks go to John Sarkissian at Parkes  and to the ABC, Charles Sammut (who persisted until he located the footage) and ABC Archivist Caitlin Hickie (for obtaining permission to make this footage available), and also to Bill Wood (ex-Goldstone) for cleaning up the audio. It was digitised and enhanced by Colin Mackellar, January 2006. Back to the main Apollo 11 TV page. Back to the main Apollo 11 mission page.